With the reduced federal income tax rate for C corporations, tax planning is now much easier, because you know this year's rate and next year's rate: 21%. Therefore, the generally appropriate strategy is to defer income into next year and accelerate deductible expenditures into this year. That way, you postpone corporate federal income tax bills. Most small and medium businesses are now allowed to use cash-method accounting for tax purposes, thanks to other changes included in the TCJA. Assuming your business is eligible, cash-method accounting gives you flexibility to manage your corporation's 2018 and 2019 taxable income to defer some corporate federal income tax until next year. Delaying invoices. On the income side, the general rule for cash-basis taxpayers is you don't have to report income until the year you receive payment. To take advantage of this rule, put off sending out some invoices so your corporation doesn't get paid until early next year. Of course, you should never do this if it raises the risk of not collecting your money. Charging recurring expenses before year end. You can charge recurring business expenses that your corporation would otherwise pay early next year on credit cards. Cash-basis taxpayers can claim 2018 deductions even though the credit card bills won't be paid until next year. However, this favorable treatment doesn't apply to store revolving charge accounts. For example, you can't deduct business expenses charged to your Sears account until you pay the bill. Paying expenses with checks and mail them a few days before year end. The tax rules say cash-basis taxpayers can deduct the expenses in the year checks are mailed, even though they won't be cashed or deposited until early next year. For big-ticket expenses, send checks via registered or certified mail. That helps prove they were mailed this year. Prepaying expenses for next year. 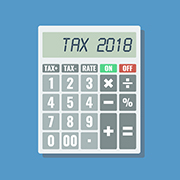 Cash-basis taxpayers can deduct prepaid expenses in the current tax year as long as the economic benefit from the prepayment doesn't extend beyond the earlier of: 1) 12 months after the first date on which your company realizes the benefit, or 2) the end of your company's 2019 tax year (the tax year following the year in which the payment is made). For example, this rule allows your company to claim 2018 deductions for prepaying the first three months of next year's office rent or the premium for property insurance coverage for the first half of next year. For qualified property that's acquired and placed in service between September 28, 2017, and December 31, 2022 (or December 31, 2023 for certain property with longer production periods and aircraft), the TCJA increases the first-year bonus depreciation percentage to 100% (from 50% for most of 2017). This break is allowed for both new and used qualified property. As long as 100% first-year bonus depreciation is allowed, it's superior to the Section 179 deduction privilege (explained below), because there are fewer restrictions on bonus depreciation. As under prior law, Sec. 179 deductions can still be claimed for qualifying real property expenditures, up to the maximum annual allowance ($1 million for tax years beginning in 2018). There's no separate limit for real property expenditures, so Sec. 179 deductions claimed for real property reduce the maximum annual allowance dollar for dollar. Purchasing large SUVS, pickups and vans can provide major tax advantages. Thanks to the unlimited 100% first-year bonus depreciation break for qualified assets that are acquired and placed in service between September 28, 2017, and December 31, 2022, you can generally write off 100% of the cost of a new or used heavy SUV, pickup or van that's acquired and placed in service in current tax year on this year's corporate tax return. To cash in on this favorable tax treatment, you must buy a "heavy" vehicle with a manufacturer's gross vehicle weight rating (GVWR) above 6,000 pounds. First-year depreciation deductions for lighter SUVs, trucks, vans and passenger cars are much skimpier. You can usually find a vehicle's GVWR specification on a label on the inside edge of the driver's side door where the hinges meet the frame. As its name implies, the new tax law includes many provisions that help C corporations cut their tax bills. In many ways, it also simplifies tax planning for C corporations. Your PDR tax advisor can supply more details on what's covered here and suggest other creative tax-planning moves for your business. While the Tax Cuts and Jobs Act (TCJA) changes many tax law provisions, it doesn't change the general tax planning priorities for C corporations. Specifically, these five rules of thumb still hold true. C corporation status isn't generally advisable for ventures that will incur ongoing tax losses. Why not? When a venture is set up as a C corporation, losses can't be passed through to the owners (the shareholders). Instead, they create corporate net operating losses (NOLs) that can be carried over to future tax years and then used to shelter any corporate taxable income. However, under the TCJA, NOLs that arise in tax years beginning after 2017 can't shelter more than 80% of taxable income in the NOL carryover year. C corporations can still be subject to double taxation. Although double taxation can still happen under the TCJA, the cost will be toned down by the new 21% corporate rate. Double taxation occurs when corporate income is taxed once at the corporate level and again at the shareholder level when paid out as dividends. Double taxation isn't a problem when a C corp needs to retain all its earnings to finance growth and capital investments.Under this scenario, all the earnings stay "inside" the corporation. So, there are no dividends paid to shareholders, and, therefore, no double taxation. Double taxation isn't an issue when a C corp's taxable income levels are low. This can often be achieved by paying salaries and bonuses to shareholder-employees and providing them with tax-favored fringe benefits (deductible by the corporation and tax-free to the recipient shareholder-employees). Your tax advisor can explain the details for tax-favored fringe benefits. In general, reducing C corporation taxable income by paying reasonable year-end bonuses to shareholder-employees is still a good tax planning strategy. C corporation status still isn't advisable for ventures with appreciating assets. As under prior law, it's generally a bad idea to hold significant assets that are likely to appreciate (such as real estate and certain intangibles) in a C corporation. If the assets are eventually sold for substantial gains, it may be impossible to extract the profits out of the corporation without being subject to double taxation. In contrast, if appreciating assets are held by a pass-through entity, gains on sale will be taxed only once at the owner level. Moreover, assets held by a C corporation don't necessarily have to appreciate in value for double taxation to occur. Depreciation also lowers the tax basis of the property, so a taxable gain results whenever the sale price exceeds the depreciated basis. In effect, appreciation can be caused by depreciation when depreciable assets hold their value. To avoid this issue, you might consider using a pass-through entity to lease to your C corporation appreciating assets or depreciable assets that will hold their value. Your PDR tax advisor can explain the details of this tried-and-true tax strategy and evaluate whether it can work for your business.